Inka Kukkamaki, On The Sauce Again. In our latest Meet the Blogger, we interview Inka Kukkamaki, the woman behind On The Sauce Again, “for smart women who appreciate spirits”. Growing up in Finland, where vodka was the most common clear spirit, Inka felt there was a real lack of information about spirits and people did not know what to look for or how to drink them. As she began to educate herself she found the stories behind spirits fascinating and she set to work creating her own blog dedicated to the cause. During her travels and research, Inka will go to the source and touch the barley they make her favourite vodka from, or help pick the grapes whilst learning to understand the origins of Pisco; a true spirit detective. When and where was your first Gin & Tonic? I don’t remember ever drinking gin until I moved to England (in Finland we grow up drinking vodka). I’m sure I had an occasional G&T without really thinking about it too much, it wasn’t until I found The Botanist during my trip to the beautiful island of Islay, that I really started paying attention to the gin itself. What started you off on your blogging journey? I never imagined I’d end up writing for a living, especially in English, but somehow it all just came together. My background is in Hospitality Management and Tourism. I used to work in a cocktail bar before I started running events (anything from weddings to baby showers), but there was a time when I felt like I needed to find a way to start building my own business, so I started to consider my options. I did some blue sky thinking and came up with the idea to start blogging about spirits as this would also take me to places outside my usual workplace. There weren’t many women writing about spirits, and the ones that did only focused on a specific spirit, so I felt there was definitely a gap for me to fill. I started from scratch. I built my website, then took part in as many drink related events to network and to get ideas for articles. Now I cover pretty much every spirit, serving tips, background stories of various distilleries and more. Today, writing is my day job, whether it is for the blog or other sites. Blogging can be hard work at times as you have to stay on top of all the social media channels, post new articles regularly, keep networking, look out for new brands and trends, take photos, create drinks etc. You constantly have to develop yourself and your skills (I’ve taken a blogging course, social media courses and I’m constantly learning about photography), sometimes I feel like I am just making it up as I go. 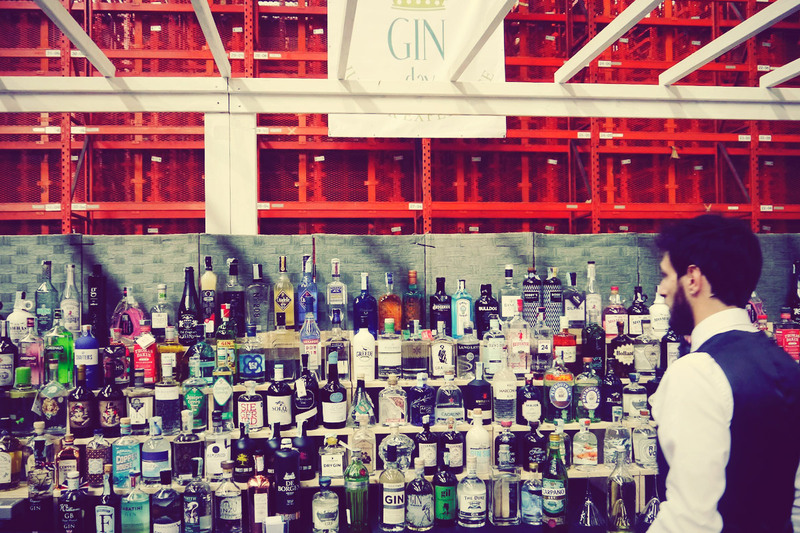 How do you stay abreast of the latest gin news? I read industry magazines, such as Imbibe and Drinks International. Being active on social media also helps to stay up to date on any new launches etc. But the best way is to take part in spirit related events. Not only can you sample a range of products, but often you get to meet the makers and really get all the gossip. Who’s your favourite gin blogger? That’s a tough one. I enjoy following Gin Monkey as Emma is very opinionated and really knows her sauce. The Gin Lord for reviews as Rory understands the technical stuff and his reviews are honest. I also always read What’s Katie Doing as Katie covers pretty much all the gin related events and tastings around London. Sipsmith also has a great gin blog on their website. I’m always drawn to bright and colourful things, whether it is a piece of clothing, a lipstick or a bottle of gin (Silent Pool comes to mind because turquoise is my favourite colour). I chose my tattoo sleeve to be full of colour so each time I look at it, it brings me a lot of joy and positive energy. I hope to find time for painting again at some stage, so I can create paintings with vibrant colours. I think this obsession with colours comes from my mother… her house is a complete mismatch of every colour you can think of. She even painted one of her walls orange and had a light blue bookcase made specially for it. Would you admit to having a favourite gin?! It was The Botanist that first got me into gin, and it is still definitely one of my favourites. 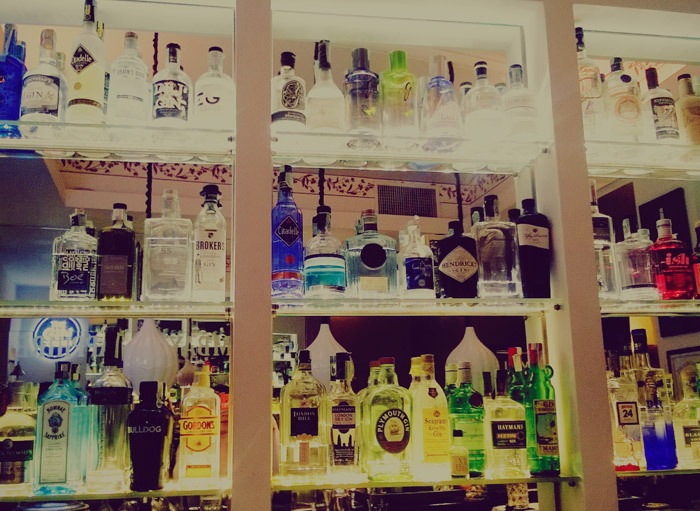 I also really enjoy Napue, Hayman’s London Dry, Sipsmith V.J.O.P, Tarquin’s and Arbikie Kirsty’s Gin, to name but a few… It really depends on my mood and how the gin can be served. What’s your personal ‘perfect serve’? I don’t like to use a lot of tonic, so I’d go for 2:1 ratio with plenty of ice. It’s surprising how many places are too shy with ice… One of my favourite serves is a citrusy gin (such as Malfy Con Limone) with muddled strawberries and cracked black pepper. I also like to use fresh herbs I grow on our terrace (thyme, rosemary, mint…). What’s the best and worst thing about being a gin blogger? I get invited to different events, tastings and distillery visits, therefore I get to sample a wide range of gins (and other spirits). But when I am not traveling or visiting places it can all get a bit much when you work on your own. Hence the enjoyment of these visits, it’s nice to chat and network with likeminded enthusiasts and professionals. Who’s supported you on your gin journey? I have great relationships with many brands and distilleries, I love how the industry is so supportive. Also, my husband (Scottish) and my friends have been great, although it might be all the gin I keep giving them… My husband doesn’t really like spirits, but I’ve managed to get him into gin so he often helps me with my tastings at home. Which Scottish Gins are you looking forward to trying out next? El-gin, because I am interested in their use of Scottish oats as a botanical. I have an unopened bottle of Kirkjuvagr Gin, which I am planning on testing soon. There’s been some chat around a little trip to the Orkney Islands this year as well, fingers crossed… Also, Selkie Gin and Hills & Harbour Gin are on the list. What plans does On the Sauce Again have for 2019? You can learn more about On The Sauce Again by visiting the links below.